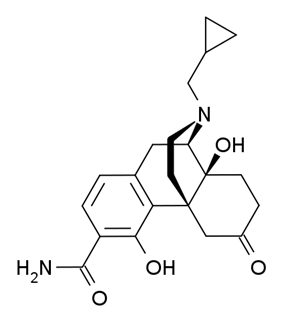 Samidorphan (ALKS-33) is a selective opioid antagonist which blocks the μ-opioid receptor, but without affecting the δ-opioid or κ-opioid receptors. It has been investigated for the treatment of alcoholism and cocaine addiction, showing similar efficacy to naltrexone but possibly with reduced side effects. However it has attracted much more attention as part of the combination product ALKS 5461, where samidorphan is combined with the mixed μ-opioid agonist and κ-opioid antagonist opioid modulator buprenorphine, as an antidepressant. Buprenorphine has shown antidepressant effects in some human studies, thought to be because of its antagonist effects at the κ-opioid receptor, but has not been further developed for this application because of its μ-opioid agonist effects and consequent abuse potential. By combining buprenorphine with samidorphan to block the μ-opioid agonist effects, the combination acts more like a selective κ-opioid antagonist, and produces only antidepressant effects, without typical μ-opioid effects being evident. ^ Hillemacher, T.; Heberlein, A.; Muschler, M. A.; Bleich, S.; Frieling, H. (2011). "Opioid modulators for alcohol dependence". Expert Opinion on Investigational Drugs 20 (8): 1073–1086.